As Valentine’s Day approaches, it’s impossible to think about the heart-filled traditions of this holiday without focusing on YOU and your OWN huge heart for The Villages children, youth and families! ️Allow Damian, Molly and Thomas to take Driver’s Education. ️Provide diapers, sleepers and board books for Ariel and the 31 other infants who became part of The Villages Therapeutic Foster Care Program in December and January. ️Support Jose in taking the SAT Preparatory Course. ️Purchase new shoes for the quickly growing busy feet of toddlers like twin sisters, Darla and Donita! 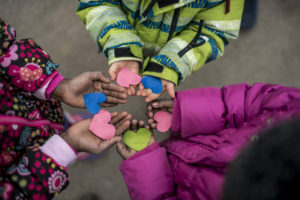 Without a doubt, your HUGE HEART for The Villages children (the 3,100 we serve each day) combined with the compassion of so many others, helps us to begin to erase disparities, impact disproportionality, and create BRIGHTER FUTURES. Your heart for The Villages will allow EVERY child we’re privileged to serve to reach his or her full potential! Hug YOUR favorite child, as soon as you can. And know that, without a doubt, your “HEART FOR CHILDREN” is changing lives daily! Lucky Us to Have Friends Like You! It’s a Merry Holiday Season Because of YOU!